An artist known for exploring issues of perception and recognition as well as identity, Yuko Nasu has created a number of portraits inspired by a cosmopolitan city inhabited by people of different characteristics and from different countries. She attempts to deconstruct the portrait's conventional concept and integrates into her artwork the intangible aura of her subjects, presenting contemporary portraits which transcend the boundary between nationality and race. 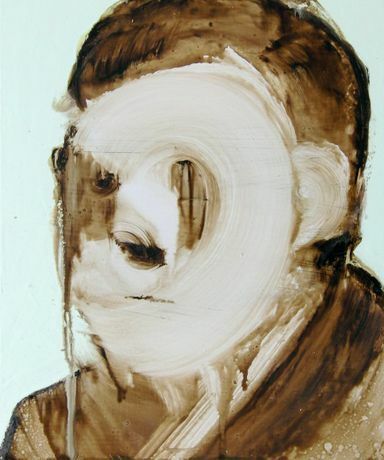 Nasu's particular form of portraiture, composed with improvised wide brush strokes and unique colour combinations, gives shape to her subject's personality, while simultaneously blurring their physical features. The results are deliberately ambiguous: the faces are unidentified and indistinct, but the unmistakeable aura remains, allowing the audience to call someone to mind from the depth of their memory rather than identifying a specific figure. Yuko Nasu is concerned with ways of perception and recognition, how we see and how we keep things in mind, and she aspires through her artworks to conjure images of people through the evocation of memory. Her recent works develop a semi-abstract style and explore ways of establishing unique characteristics without resorting to literal depiction of detail. They suggest that our visual memories can be connected with psychological more than physical conditions. Consequently, each viewer is likely to interpret her artworks differently. The exhibition encourages the audience to act as detective in recreating an identity from the indistinct images before them.